Everyone has been asking whether I kept racing after upgrading to Cat 3, so I've decided to write a brief end-of-season report. I raced three races as a Cat 3 before I moved back to California: two stage races and one crit. I was also tired of racing alone, so I joined Essex County Velo. Michael Tonkinson, Colin Murphy, and Pierre Vanden Borre--the BU students I'd been getting rides to races with--are all members, as are MIT cyclists Ariel Herrman and Jason Sears. Also in ECV is Matt Roy, who with a broken femur is now the club's director sportif. 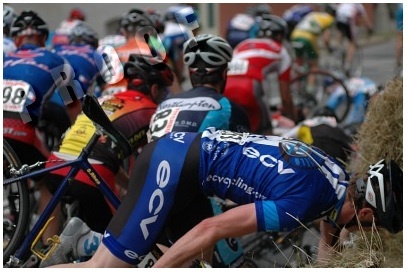 The first stage race was the Fitchburg Longsjo Classic, the largest stage race in New England every year. I had wanted to do this race from the moment I heard about it, but the Cat 4s filled up in February (!). With my upgrade in hand, however, I was good to go. Sadly, I also had one hell of a cold after too much partying during a research trip to Helsinki (where the bars don't close until 4 AM and it never gets dark). So I started Fitchburg on antibiotics--not a great plan. While I was one of the stronger climbers during an ECV training camp before Helsinki, by the time the road stage started I had trouble just hanging with the pack. That said, I got stronger every day, and by the final crit I was feeling pretty comfortable in the 3s pack. My new teammates, on the other hand, cleaned up. Ariel won the road stage and took second in the GC, and Colin took the points jersey. Did I say I was feeling comfortable during the crit? Maybe a little too much so, as I crashed with two laps to go. There was a nasty pair of corners on the course, one right after another, and the first was right after a fast downhill stretch. All race long people had been coming into the first one too hard and braking into the turn, showing really poor form. It scared the hell out of me at first, but once I was able to anticipate it, it was no big deal. By the end of the crit, however, I was pretty tired and not paying enough attention, and I came through the first corner to see a pile-up forming ahead of me. 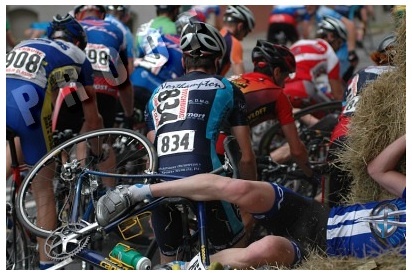 Believe it or not, there is a "right way" to crash your bike. Keep your hands on the bars, your feet on the pedals, tuck your chin all the way to your chest, and hang on; this posture will keep delicate things like your face off the pavement, and it keeps you from breaking a wrist or ankle, too. So when I first saw this photograph, I was really embarrassed. What the hell was I thinking? With only two laps to go, the free lap rule was no longer in effect, so I just rode it in easy with the other guys who crashed. Unlike the rest, I had hay sticking out of my jersey as we crossed the line. The next race I did as a 3 was the Workingman's Stage Race, so named because all three stages--a time trial, a road race, and a points race--are held on weekday evenings. I was super-excited about Workingman's, as I was no longer sick, my form was returning, and it was a Cat 2/3 race, meaning it would be really fast. I was also hoping the time trial would be a good chance to redeem my terrible performance in the Fitchburg TT. My hopes turned out to be well-placed, as I came in 23rd, with about 10 Cat 2s in front of me, so more like 13th out of the Cat 3s. I also averaged 363 watts for 15:46, a new personal record over that time length. After the time trial, Colin was the best placed of my teammates, so our plan from there on out was to try and move him up in GC. During the road race, I managed to cover a number of attacks until Colin and Pete slipped off in a breakaway after about 2/5 laps. Thereafter I blocked like mad, trying to keep the Cat 2 team whose leader was in the break from inexplicably chasing him down. In the end, Colin placed well enough to move up from 13th to 7th, a huge success for him and the team. 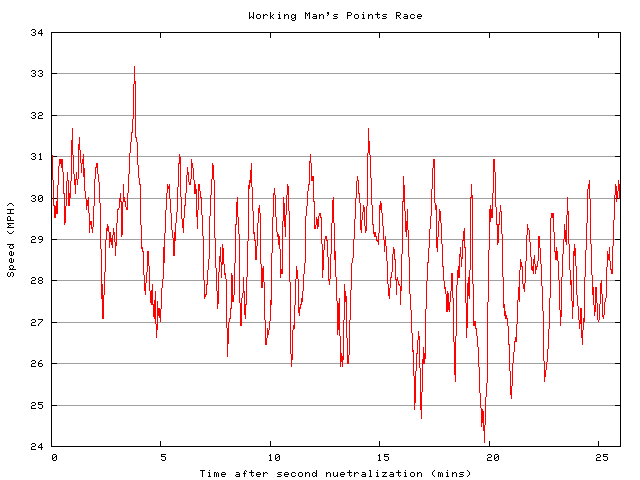 The final stage of Workingman's was a points race. Held on a oval-shaped, 300-meter car racing track, it consisted of 80 laps. There was a sprint every five laps, with points awarded to the first, second, and third place finishers of every sprint. The sprints at halfway through and the finish were worth double points, and the cyclist with the most points by the finish is the winner. Note that it never dips below 24, and it keeps peaking up above 30 for each sprint. Now realize that I wasn't even contesting the sprints; I have no idea how fast the guys winning them were going. While I merely survived, however, Colin managed to win enough sprints to move up to 4th in the GC by the end of the day, an incredible result against a field with a number of Cat 2s. The last race I did for the season was the Concord Regional Champs Criterium. As with Workingman's, I was doing this one mainly for the workout. Moreover, it was a Pro/1/2/3 race, meaning it was my first ever chance to race with the pros! With that in mind, my only real goal was to not get dropped. 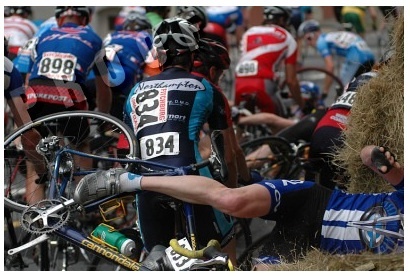 Given that it was a hill crit, I was a little worried about my chances for success. As it turned out, it wasn't too hard to sit in during the race. After a fast and somewhat intimidating first lap, I found my rhythm and sat around 30th wheel. At that spot, the pack is 3-4 riders wide, and the draft is huge. I still had to punch it up the hill each lap, but there was plenty of time to recover in between. Around 5 laps in, I decided to move up, punching it extra hard up the hill to put myself into the top 10. I quickly discovered, however, that the pace felt much higher near the front where everyone was spread out single-file, and after 2 or 3 laps I had to drop back into the main pack to recover. I stayed midpack for the remaining 20 or so laps of the race, as I didn't really have anyone to work for and I knew I wasn't in shape to contest the sprint. In the end, it was a good confidence booster to have to think about heading into next season. This season, however, is over, and I'm now concentrating on cyclocross season this fall. Stay tuned for updates about that.